The RAT-3 has a 3mm thick 1095 Carbon Steel Blade with a non-reflective Zinc Phosphate Finish. A 93mm overall cutting edge (Rc 57-58) with a tough drop point and an overall length of 200mm (8"). 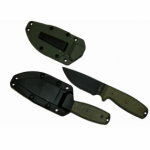 The green canvas Micarta handle is extremely comfortable in the hand even when wet and is secured to the full length tang by stainless steel screws. The extended pommel has a lanyard hole. 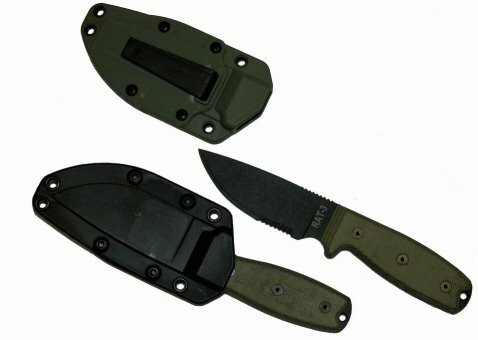 The Molded sheath is fitted with a boot/belt clip which can be changed to a TekLok attachment. Attachment and instructions included. Sheath available in Black only.